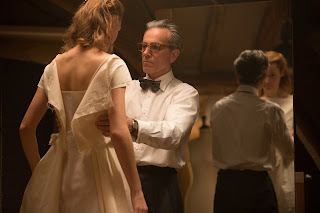 A whimsical romance set in the world of fashion, Phantom Thread examines mischievous relationship dynamics churning below the surface. The setting is London in the 1950s. Meticulous batchelor Reynolds Woodcock (Daniel Day-Lewis) runs his distinguished fashion design house creating dresses for women in the upper echelons of society. His sister Cyril (Lesley Manville) is his constant companion and main support, and she helps manage his moodiness. On one of his emotional downswings Reynolds takes a trip to the countryside where he meets waitress Alma Elson (Vicky Krieps). An instant attraction develops, and Alma joins Reynolds in London as his new muse and lover. Alma has to quickly learn how to navigate around Reynolds' strict habits and expectations. But she refuses to simply yield to the docile role Reynolds has predefined for her, and she probes at his psyche to get to know the man behind the legend. When a Belgian princess commissions Reynolds to create a wedding dress, Alma senses his attention drifting away from her, and starts to search for a way to redress the balance. After the mediocre The Master and disastrous Inherent Vice, Phantom Thread represents a return to form for writer and director Paul Thomas Anderson. Day-Lewis and Anderson previously teamed on the epic There Will Be Blood, and here actor and director again delve into the soul of a driven men determined to bend every detail of life to suit his idiosyncrasies. But Reynolds Woodcock is wholly dependant on others for his success, in need of a dedicated sister to keep a watchful eye over his state of mind and a rotating muse to spark artistry. The clash between genius and dependency lays the foundation for a baroque romantic drama with a sprinkling of humour. With the classical music of Jonny Greenwood perfectly capturing the mood of sly behaviour hidden behind the facade of formality, an intricate triangle is assembled between the designer, the sister and the new lover. 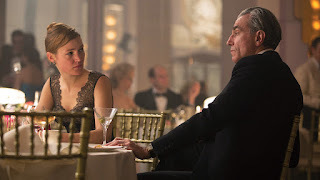 And the relationship dynamics are the throbbing heart of Phantom Thread. While Reynolds is presumably the main protagonist, Alma ever so softly moves to centre stage in the second half of the film. The 1950s setting is a strictly male-centred world, but Anderson's story is about a woman quietly shaking the status quo of societal expectations. While Cyril has long accepted her role as doing whatever is necessary to enable Reynolds' success, Alma wants more, and will have to conjure up unconventional methods to get what she needs while still playing within the rules of the day. Anderson crafts every scene with perfectionist fluidity, the filmmaker echoing the dressmaker's love for profound creativity based on customized attention to detail. Phantom Thread is a visual banquet, Anderson taking up residence in Reynolds' superficially staid house and uncovering a cauldron of activity and emotions. The three central performances are delicately balanced and strike perfect tones throughout. Day-Lewis, in what may be his final pre-retirement role, brings the intensity of a coddled creative genius to the screen. Reynolds is far from easy to love, and Day-Lewis seeks out the conflicts between his need for human warmth and a natural tendency for aloofness. Lesley Manville projects coldness borne out of Cyril's lifelong commitment to her brother, a pact that means she has a comfortable life but not of her own. The revelation is Vicky Krieps, who matches Day-Lewis and indulges in the silent interludes where a woman needs to do all the work to see the path ahead and quietly change it. Krieps allows Alma's subtle actions to speak loudly, a woman challenging her man's obtuse needs and daring to recast her role in his perfectly organized world. Phantom Thread weaves a complex dress, full of intriguing details and delightful use of luxurious fabrics.